specifically: is it harmful to eat the thin, brown skin (for lack of a better word) that surrounds the raw, white coconut meat? Once I have drained the coconut and removed the hard outer shell, I just dig in and enjoy. In order to avoid damaging the GI tract should I be cutting the brown part off and only eating whatever is white? ...is this thing from Earth? I hope you use the water you drain from the coconut... my practice is to use it to make scrambled eggs. Dan, welcome to PaleoHacks. Please do not include your blog link in your answers. See the FAQ regarding self-promotion. Dude I would so eat that crab. so far, this is the first comment/question about eating a raw coconut out of the shell. I love coconut and just ate a whole one in two days. Not a regular practice, but wonder if that is too much. I always eat the thin brown skin, doesn't seem to bother me at all. beautiful!! Is that a standard size trash can? Just get some butter and a HUGE pot!!! I bet the crab's tasty, too. Wow, those crabs are awesome! Usually, outer coatings of seeds and fruits contain a mixture of antioxidants and antinutrients, both of which are designed to protect the important plant product from natural decay and predators. So, one might hypothesize that the pellicle has harmful antinutrients; but in the absence of positive indications of that, I wouldn't worry about it. From the plant-defense perspective. A coconut is pretty well protected without having to invest additional energy into a toxic "wrapper". 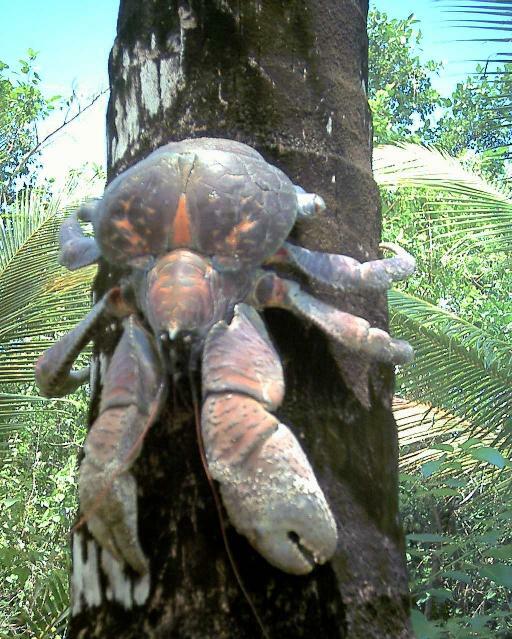 The only other animal that I know of (besides humans) that eat coconut is that insane crab. Whoops, that's a burger-eating, cheapskate crab. The thin brown membrane is known as a pellicle. You can peel it off using a standard vegetable peeler. But if you don't mind the taste or texture, you don't need to, apparently. But I haven't studied the chemical composition of the stuff, just I see (from my google search) that certain fans of coconut don't mind eating it. I always eat the brown part. I have never heard of it being harmful. Unless it hurts your GI track, go for it. I know it kills mine. I think the raw coconut does taste better and have better texture with the thin brown "membrane" on the outside. You can eat it. To find out more about coconuts go to The Coconut Research Center at: http://www.coconutresearchcenter.org/ Coconut is a super food.